How appropriate! You fight like a cow! Gamers born before 1990 almost universally cut their teeth on the now-moribund adventure genre. Justly criticized for the often obscure logic of their puzzles and the fundamentally uninspiring click-everywhere-try-everything gameplay, adventure games fell out of favor in the face of more visceral first-person shooters and action-adventures. Those who played them, however, fondly remember the clever writing and charming personality of these games, particularly those produced by LucasArts. In recent years, they have seen a slight resurgence of popularity, thanks in part to the efforts of TellTale games, who revived Sam & Max as an episodic game series. Now they have pulled the same trick with the Monkey Island series, and as part of the launch of the new series, the original Secret of Monkey Island has been released in a new special edition, with spiffed-up graphics and an all-new voice track. Yes, I think you should buy it. In general, I think the older games that essentially walked 2-D sprites over pseudo-3-D fields have aged better than early polygonal 3-D graphics, but the new coat of paint serves The Secret of Monkey Island very well. The designs faithfully render the overall look of the original, while adding a whimsical flair that meshes perfectly with the game's irreverent tone. The voice acting is somewhat less successful, in part because some lines get repeated quite a bit, and in part because the speaking slows the pace down. Hearing the swordfighting insults in full voice, however, is more than adequate compensation. The primary weakness of the special edition is that it's still the same game, which means nobody is applying any of the lessons learned from the downfall of the adventure genre. The puzzles are still fairly obscure, you still have to click on everything in sight in order to progress, and you still have to figure out how on earth you can use a rubber chicken with a pulley in the middle. Fortunately, there is a light hint system available, one that judiciously directs the player towards the right answer without spelling things out. It's perhaps not as satisfying as figuring out all the answers yourself, but it's more fulfilling than a trip to GameFAQs. Of course, if you don't find any of this appealing, you can revert to the original game with the touch of a button, on the fly. Underneath the new spit and polish, The Secret of Monkey Island hasn't really changed. For those of us who remember that a man's wit must be as sharp as his blade, that's an ideal kind of update. 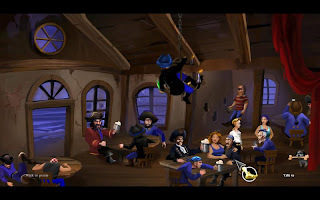 And for those who never learned what to say when a sword master calls you a pain in the backside, The Secret of Monkey Island is about the best possible introduction to a style of play that once dominated computer gaming. Tales of Monkey Island: Launch of the Screaming Narwhal is available on Wii and The Secret of Monkey Island SE can be downloaded on XBox Live Arcade. Both games are available on Steam for PC. Oh Tron, How Do I Love Thee? Sorry for the lack of posts this month. I've actually got plenty to write about, just no time to write about it. Eventually I'll be getting more than 5 hours of sleep a night again and will have a little more energy for blogging. Could be next week, could be next month. Until then, I stumbled across the trailer for the newest Jean-Pierre Jeunet film. Not speaking a lick of French, I don't even know what the title, Micmacs à tire-larigot, means. Judging from the trailer, I'd say it's a comedy heist film. Whatever it's about, it's sure to be pretty. I don't love every Jeunet movie, but I love many of them, and they're all pretty. As I commented on EJP’s thread, I have been less than thrilled by music releases this year. For me, while there have been some above average releases (at least using the Pitchfork barometer [PFB]), there has not been a single release that I have got lost in and played over and over again. I think this one will inevitably move down the chart. I like the album, but I don't think it has staying power for the rest of the year. No surprises in my top 3, based on the reviews I gave them. The order of albums below that is somewhat interchangeable. There are a few things that didn't make this list that are a little surprising to myself. No Decemberists, Say Hi, or Beirut. I wouldn't say I'm really disappointed by these albums, but I'm just not listening to them as much as I would have expected based on how much I like the artists. I was disappointed by some other artists, like Camera Obscura, Bishop Allen, and most notably, Clem Snide. But it happens. So far, 2009 has been pretty dense with releases by artists I know and like. The next couple months are pretty sparce in terms of new albums by artists I know, though I have my eye on releases by YACHT, The Dodos, WHY?, Islands, Thao, and maybe The Flaming Lips (See Pitchfork for list of upcoming releases). And maybe my next favorite album is by someone I've never heard of. Any albums I didn't mention here or in previous reviews that I've clearly been missing out on? I seem to be having tremendous difficulty with my lifestyle. First time at R.B. 's L-C? First, you should probably know that this blog has nothing to do with Ray Bradbury. Sorry if that's what led you here. Also, there's not all that much about camels. Actually, you're far more likely to someday find something on here about Ray Bradbury than camels, but I digress. For an indirect explanation of our name and a mission statement (of sorts), please check out our first post.